We are happy to assist 24 hours a day, 7 days a week so if you have any questions about AP&T Internet services or require technical support, please contact us toll-free at 1.866.793.4179 or email us from our Contact Us page. Are you having trouble with your internet connection? Try powering your router off for about twenty seconds, then back on. While your router is powering on, check that all of the cable connections are tight and secure. After waiting a few minutes for the router to completely power back on and connect to AP&T, check the internet connection and if it’s still not working, reboot your computer or device and try the connection again. Still not working? Give us a call at 1.866.793.4179. AP&T internet access requires the username and password provided during the sign-up process. For AP&T Broadband, the username and password would be used to configure PPPoE settings in the routing equipment. How should I set the DNS server settings? How should I set the IP address settings? The IP Address settings should always be set to dynamic (server assigned). If you have requested a static IP address, please leave your IP address set to dynamic (server assigned). Static IP addresses are tied to your username so our server will provide you with the static IP address you were assigned each time your router authenticates. Can I obtain an IPv4 Static IP address? Single IPv4 Static IP Address for $10.00 a month. /30 IPv4 Routed Network for $25.00 a month. /29 IPv4 Routed Network for $45.00 a month. APTAlaska.net email requires authentication and SSL or TLS for your incoming and outgoing email servers. In the event you are experiencing issues with setting up outgoing email, please click on the toggles below to verify the settings in your email client. Need Help? The Technical Support folks are available to assist you over the phone at 1.866.793.4179. OK I have an email account username and password, what settings will I need to setup my email client? All customers must authenticate to send and to receive messages. When configuring your email client, please remember to select “Use outgoing authentication” and use password in plain text. Since the communication with the server is already configured to use SSL, the password will actually be encrypted during the transmission process. If your preference is to use TLS instead of SSL, that will work fine, just leave the port set to 25 and be sure to set the encryption to TLS. Be sure the username sent to our server for authentication matches the aptalaska.net email address in order to send email. Alternatively, you can access your aptalaska.net Email via web browser at webmail.aptalaska.net. Review Outlook/Thunderbird/MacMail Configuration in a new browser window. Review iOS Email Configuration in a new browser window. Review Android Email Configuration in a new browser window. Multiple Addresses: AP&T Broadband subscribers are provided (upon request) up to 4 email addresses per broadband account. Large Mailbox: AP&T provides 5GB of email storage per email account. IMAP: Allows you to connect to the mail server and read your mail from it as opposed to downloading your mail with POP3. This feature is great for managing your email across multiple devices because all of your mail and folders will be synchronized across devices. TLS and SSL: Connections to the AP&T email server require encryption for your security. Spam Filter: We run all email messages through a spam filter to help reduce the amount of junk email in the world. All incoming email that is identified as spam will be sorted into a Junk folder by default. Messages in the Junk folder are automatically deleted after 2 weeks unless you move them to your Inbox or other mail folder. Virus Scanner: We will scan all of your incoming email for viruses and delete message found to contain a virus. Since people create and unleash viruses to the public on a daily basis, simply having a virus-scanning program isn’t always enough to protect you from the latest threats. The virus scanner on the email server updates every hour so you can be sure that you will have the best protection available. This feature is automatically activated with every email account AP&T offers to our valued customers. Webmail: This feature allows you to access your email from webmail.aptalaska.net, this could be very useful while you’re on the road or away from your computer, especially when utilized with IMAP. Below you can find some frequently asked questions related to AP&T email, spam filtering, and virus scanning. How do I send email through an alternate email provider while using AP&T Internet? If you have an email address using your own domain name through another email or web hosting provider you will be required to use the outgoing email server (SMTP) provided by your email service or hosting provider. Only email from authenticated aptalaska.net email accounts can be sent through AP&T’s SMTP server. How do I send email from my copier or Point of Sale terminal while using AP&T Internet? The improved security features of the AP&T email system makes it nearly impossible for attackers to abuse our service, but it can also make it a little more difficult for devices to send mail, too. If you need your copier to send you PDF files, or your Point of Sale terminal to email customer receipts and your device allows for outgoing authentication and encryption, use the information found in the Email Settings section above. How does the spam filter sensitivity system work? This option sets the spam filter sensitivity for your email account. If you set the sensitivity to ‘high’ then the spam filter will catch most of the spam sent to you and direct it to your Junk folder, however it may also occasionally catch legitimate email. We recommend using the ‘high’ setting and make it the default for all of our customers. If you find that this setting is preventing you from receiving legitimate email you can lower the sensitivity, turn filtering off, or you can use the Whitelist/Blacklist feature described below. Turning the filter off will allow all incoming email messages to go straight to your Inbox. If you disable the filter we strongly recommend that you get your own spam filtering solution in place as 85% of the messages sent to the email system is spam. Why is the message I'm sending to one of your customers being rejected as spam? Messages are rejected as spam only when an AP&T customer has their spam filter settings set to reject spam and the sender’s message looks to be more “spammy” than the AP&T customer’s spam filter sensitivity allows. Our spam filter looks at the senders reputation, country of origin, attachments, and looks for specific keywords as a few of the criteria that determines your spam score. If the recipient isn’t receiving your message, please ask them to check their Junk folder and consider Whitelisting you. Why is my outgoing email being rejected? In order to protect the integrity of the AP&T email system we have implemented strict guidelines for using our email server. Are you sending from a 3rd party email address (ie: me@mycustomdomain.com)? This is called relaying and is no longer allowed by the AP&T email server. Please see the “How do I send email through an alternate email provider while using AP&T Internet?” section above. Are you authenticating as the email account that you are sending from (ie: your authentication is set to use the username “Fred” but you are sending from wilma@aptalaska.net)? This is called spoofing and is no longer allowed by the AP&T email server. Please configure your email client to authenticate with the correct credentials. Are you sending from a device (ie: cellphone or laptop) connected to another network (ie: GCI, Verizon, etc.) and your message looks “Spammy” to our server? Messages coming from a device with a non-AP&T internet connection are subject to the same spam filtering rules as incoming email messages. In other words, a message you are trying to send from your Verizon cell phone will be subject to spam filtering if you are using the cellular network, but not if you are using WiFi in your home from AP&T. Are you sending to a large email list? AP&T email customers are allowed to send up-to 500 email messages in one hour. Send 501 and your messages will be blocked and your account will be disabled requiring you to contact Technical Support to reset your password. I don't want AP&T to filter my email, can I turn off spam filtering? Sure! Log into the AP&T Customer Portal and from the Email Settings section change the spam filter sensitivity to “off”. What executable attachments are automatically filtered? ade, adp, app, asd, asf, asx, bas, bat, chm, cmd, com, cpl, crt, dll, exe, fxp, hlp, hta, hto, inf, ini, ins, isp, jse, lib, lnk, mdb, mde, msc, msi, msp, mst, ocx, pcd, pif, prg, reg, scr, sct, sh, shb, shs, sys, url, vb, vbe, vbs, vcs, vxd, wmd, wms, wmz, wsc, wsf, and ws. If you need the ability to receive attachments with one of these types then please check the ‘allow executable attachments’ box in the Email Settings section of your Customer Portal. If you want to allow executable attachments from specific senders but block everyone else, please add those senders to your Whitelist. Whitelisted senders will always be omitted from spam/attachment filtering. Is there an option to restrict who can email me? Yes! The Whitelist/Blacklist features (found in the Customer Portal under Account and then Email Settings) can help you with that. To block all messages except a pre-determined list of approved senders check the “Only accept messages from your allowed senders list” box. Click the “+” next to the word “Whitelist” to start adding addresses. Anyone added to your Whitelist will automatically skip spam and virus filtering so that all of their messages will go straight to your inbox. To block specific senders click the “+” next to the word “Blacklist” and begin adding the email addresses of senders you wish to block. Messages from these senders will be rejected by the email server and will not make it to your inbox, unless you are part of a group of recipients. Since we cannot use the rules of one user to block messages from reaching another, you will receive messages sent to a group regardless of your Blacklist settings. Don’t forget to click Update after you are finished! Is there an email attachment size limit? Yes, you can send up to 40Mb in attachments. If you have more than one attachment, they can’t add up to more than 40Mb. These things are confusing to me, can you have someone explain it to me? Sure, please contact AP&T Technical Support at 1.866.793.4179. By browsing the internet, viewing images online, downloading music, streaming video or online gaming, a subscriber is constantly moving data via their broadband internet connection. Monthly broadband data usage can be explained as the amount of data that a subscriber moves on a monthly basis. How can I check my monthly broadband data usage? Subscribers can review their broadband usage by going to portal.aptalaska.net and following the instructions to access their account. Of course, if you have any trouble accessing the AP&T Customer Portal or have questions about your broadband data usage, please contact your local office or AP&T’s technical support team toll-free at 1.866.793.4179. What does AP&T mean by monthly? Effective February 1st, 2017 AP&T has moved from billing broadband usage based on the calendar month to billing based on the billing cycle associated with the locations we serve. Cycle 1 for Metlakatla, Wrangell is the 8th of the month through the 7th of the following month. Cycle 2 for Craig, Hollis, Hydaburg, Naukati, Thorne Bay is the 15th of the month through the 14th of the following month. Cycle 3 for Petersburg is the 22nd of the month through the 21st of the following month. Cycle 4 for Coffman Cove, Haines, Kasaan, Klawock, Northway, Skagway, Tok, Tetlin and Tanacross is the 28th of the month through the 27th of the following month. Notes: The Cycles begin at 12:00:00 AM and end at 11:59:59 PM. Your billing cycle is identified in the in the Customer Portal by clicking Usage and reviewing the Billing Period column. Will AP&T provide notification if my monthly broadband data usage limit is reached? AP&T will automatically notify you regarding your monthly broadband data usage limit. When your broadband exceeds 75% and then 90% of your monthly data usage limit and each 5% there after, an automated email will be sent to the email account associated with your broadband service. To configure your email notifications, visit our Customer Portal. Once logged on select Account and check the box next to Notifications about your service. If you would like to receive notifications with an email address other than your aptalaska.net account, click the + after Usage Notification Address and enter the desired email address. Remember to click Update at the bottom of the page to save your changes. Please keep in mind the automated emails are ran once per day and usage information for today is available tomorrow. How much broadband usage should I expect to see from popular web services? Are there some things I can do to reduce my broadband usage? Will my broadband stop working or slow down if my monthly data usage limit is reached? AP&T broadband service does not stop or slow down due to reaching a monthly data usage limit. In the event you exceed your monthly data transfer limit, you may be billed a prorated change based on your subscribed broadband service tier and the availability of Rollover data. Does AP&T only count downloaded data? AP&T tracks all data that passes through the broadband router at the customer’s premise. Tracked data includes both uploaded (information you send) and downloaded (information you receive). What is the charge to my account if my monthly broadband data usage limit is exceeded? Broadband usage charges are prorated per gigabyte (GB) according to your subscribed service tier. For example, if you transfer half of a GB more than your subscribed service tier allows, you will be billed for the half of the per GB overage rate stated in your selected service tier. Why does streaming video or downloading music use so much of my monthly data? Some of these files can be very large and therefore they take up a lot of your monthly data. The most common causes for exceeding your broadband data usage limit are streaming video, downloading music and movie files in addition to file sharing programs. Even websites that appear to be primarily text based such as the Facebook news feed, can have photos and embedded videos that auto play that will consume a deceivingly large amount of data. Can you tell me how much data my child's iPad used this month? At this time AP&T does not have the ability to specify usage at the device level. Traffic is traceable to the modem, but not beyond that. Why am I seeing usage when my computer is turned off? The most common source of “unknown” data usage, even when the computer is turned off, is often related to a cell phone or tablet that the customer has authorized to connect to their wireless network. Turning off your computer used to be a reliable way of stopping data from flowing through your network and that is no longer the case. Downloading or updating apps on a cell phone or tablet, watching movies or browsing Facebook are all items accounting for larger and larger amounts of data consumption nationwide. Most recently, customers who have installed a new video streaming device such as AppleTV or Amazon Fire TV Stick have seen dramatic increases in usage. Typically, this increase is due to default screensavers and auto-play settings. Please check default settings on any new device connected to your network. Computers often download and install updates during off-peak hours. Check your antivirus software, Windows Updates and third-party software such as Adobe, Java and Apple for update history and settings. Computers infected with certain types of viruses could be causing noticeable data transfer through your Internet account. Your broadband service has a certain amount of “overhead” which is required to keep your connection up and track activity. This is common with all service providers, is experienced by all users, equates to a minuscule amount of data transfer and is unavoidable. If necessary there is a simple work around: turn off your broadband router when it is not in use. This will cause your link to the Internet to stop completely thus eliminating all usage. Why did AP&T decide to set usage limits on broadband products? Data transfer to the Internet is costly in rural areas of Alaska and the demands on our network are increasing. Imposing usage limits on our broadband products allows for a balanced network and ensures quality service to all of our valued customers. We are constantly looking for ways to enhance our broadband products and are pleased to offer broadband Rollover data. 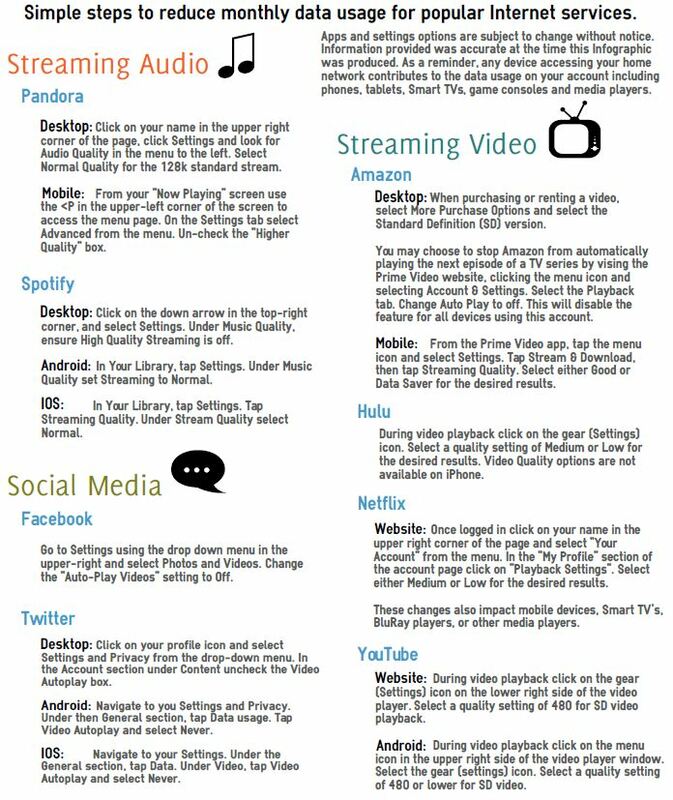 Please review the guidelines provided below that should be applied in conjunction with our Terms and Conditions for broadband service. Any unused data associated with an eligible broadband tier will roll over into the next month. Unused monthly Rollover data won’t expire for a full 12 months and any unused data you do have will accumulate from month-to-month throughout the year. Which AP&T broadband tiers come with Rollover? All of the AP&T Broadband service tiers are Rollover eligible with the exception of Wireless Broadband. Rollover is included in the price of eligible AP&T Broadband tiers. When does Rollover data expire? Accumulated Rollover data will expire after 12 months. Example: if you have 11GB of unused data at the end of the month, it will roll over into the next and continue to do so until it gets used up or expires after 12 months. Essentially data will expire first in, first out based on when it was accumulated. In what order is all of my broadband data used up? The data provided with your subscribed broadband tier will be used first and available Rollover data will be used second. What happens to my Rollover data if my broadband tier is changed? If you change your broadband tier the Rollover data attached with your broadband account will remain available on the updated tier (effective December 1, 2017). What happens if I cancel my account or my services are suspended? If your internet service is canceled at your request or suspended for any reason including non-pay, then any Rollover data you’ve accumulated will be reset to zero. What happens to my Rollover data if I move? Moving to a new residence won’t affect your Rollover data as long as the subscribed broadband tier is not downgraded. Can I use Rollover for cash or credit? Unused data cannot be exchanged for cash or any other form of credit. Can I gift my Rollover to another customer? No, Rollover data can only be used by the customer account that accumulated it. How can I track my Rollover and data usage? Simply go to portal.aptalaska.net, log in, click on Usage and the Rollover information will be right there mingled in with subscriber usage information. Depending on location, AP&T provides DSL or Wireless Broadband. To review the broadband service available in your area, please refer to Broadband Pricing or contact your local office. The use of a managed AP&T DSL modem is required to obtain service. A $30.00 setup fee is charged when our DSL Broadband service is requested and customers are provided with a managed DSL modem with routing capability, four LAN (Local Area Network) ports and wireless. Custom changes can be made to the SmartRG branded modems by accessing the AP&T Customer Portal and logging-on with the customer’s username and password. 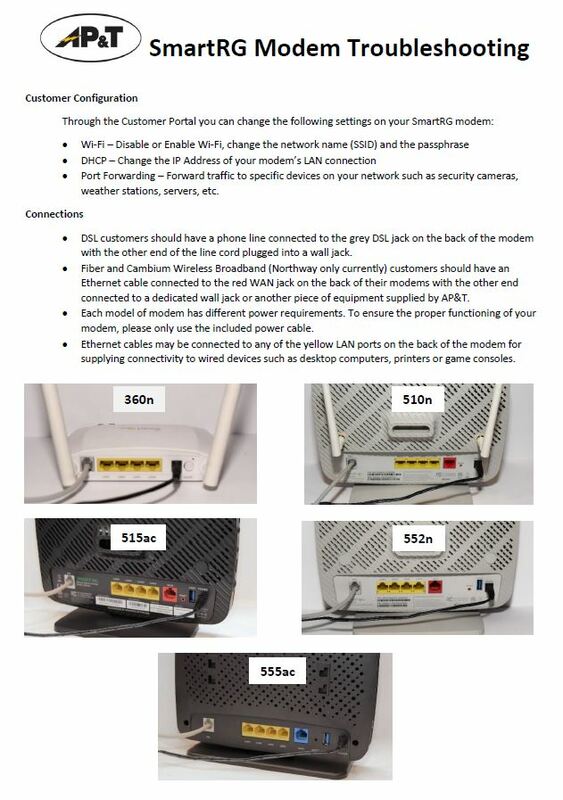 Please note: The modem’s routing capability is optional and if not selected, the customer will provide a device (typically a router, computer or gaming system) in order to establish a PPPoE connection. The AP&T DSL modem remains the property of AP&T and must be returned in working order when the service is disconnected. If the AP&T DSL modem is lost, stolen, damaged or destroyed during use as a customer or otherwise not returned, the customer agrees to pay AP&T a $50.00 replacement fee. The demarcation point for AP&T DSL Broadband ends at the Ethernet LAN interface(s) on the broadband modem and any inside wiring beyond the Network Interface Device (typically located where telephone services enter the premise) are the customer’s responsibility and could incur an additional charge. The use of a managed AP&T EUM (End User Modem) is required to obtain service. A $100.00 installation fee is charged when Wireless Broadband service is requested customers are provided with a managed EUM, router (optional) with four LAN (Local Area Network) ports, wireless (802.11b,g,n) and outdoor antenna. Please note: The Thompson branded managed router supplied by AP&T upon request does not support custom configuration changes such as Port Forwarding. In the event the managed AP&T router is not requested, the customer will provide a device (typically a router, computer or gaming system) in order to establish a PPPoE connection. The EUM, antennae and managed router remain the property of AP&T and must be returned in working order when the service is disconnected. If the managed router is lost, stolen, damaged or destroyed during use as a customer or otherwise not returned, the customer agrees to pay AP&T a $50.00 fee. If the EUM and antenna are lost, stolen, damaged or destroyed during use as a customer or otherwise not returned, the customer agrees to pay AP&T a $200.00 fee. The demarcation point for AP&T Wireless broadband service ends at the at the Ethernet LAN interface(s) on the managed AP&T router or if not selected the Ethernet LAN interface on the EUM. Any LAN (Local Area Network) wiring beyond the EUM are the customer’s responsibility and could incur an additional charge. Are you having trouble with a Wireless (Wi-Fi) device? Wi-Fi light is off – Your modem may be in Bridged mode or the Wi-Fi has been disabled. Please log into the Customer Portal from another device and check the Wi-Fi option in the Modem menu. If you do not have Wi-Fi option in the Modem menu of the Customer Portal, your modem is Bridged. Wi-Fi light is on – You may be using the incorrect network or passphrase. Please check the documentation provided with your modem or log on to the Customer Portal from another device to change the Wi-Fi settings. Help Desk can assist by changing your network name and/or password, but they cannot retrieve your current password. Are you have trouble with a Wired (Ethernet) device? LAN light is off – If your device is connected to yellow LAN port 1 on the back of the modem but you don’t see a green light next to LAN1 on the front of the modem, please check that your Ethernet cable is connected on both ends by unplugging it and plugging it back in. Make sure you hear the click indicating that it is seated properly. Try a new cable if you have one. And, verify that the cable you are using has 8 little copper pins in the end. A cable with only 2 or 4 pins will not work properly. LAN light is on – If the light for your corresponding LAN port is on or blinking, check that your device has a valid IP address, and check to see if it may be downloading updates. If you need assistance, please contact the Help Desk. Is your device connected but unable to get online? A red internet light – May indicate that the modem is attempting to download its configuration, that there is a password issue, or that the account is disabled. If you see a red internet light which lasts for more than 10 minutes, please unplug anything connected to a yellow LAN port. Contact our Help Desk if you are still unable to get online. A red power light – The device has been reset to default or has not yet been configured. If you see a red power light please use the power button to turn the modem off, then back on again. DSL light(s) is off – Reboot the modem and check the cables. If the DSL light doesn’t come on it is because the DSL service can’t be detected on that jack. Please move the modem and connect the line cord to another jack. If you are unable to find a jack that works or the jack you are using has previously worked, please contact our Help Desk. DSL light(s) blink but never turn solid – Please check your cables and connections. If you still cannot connect, please contact our Help Desk. Is your Internet connection slow or dropping intermittently? Slow and intermittent connectivity can be caused by high usage from devices on your network. Please log into the Customer Portal and use the Usage tab to see how much data you are currently using. Also, under Modem check Devices to make sure that you recognize all of the devices currently connected to your modem. To assist in troubleshooting, please ensure that you are testing from a device with a wired (Ethernet) connection to the modem and that you are using the ookla.aptalaska.net website. All port 25 traffic not bound for an APT mail server is blocked by default. AP&T Internet Services and other Internet Service Providers are blocking Port 25 to reduce spam and viruses from being propagated out of their networks. As more and more ISPs block Port 25, spammers will be pushed toward those ISPs who are not blocking Port 25. Chances are high that this pattern will accelerate the move to Port 25 blocking by all ISPs. If you have AP&T Internet access and host your own email server then you will need to contact AP&T Technical Support at 1.866.793.4179 and ask to have the Port 25 (SMTP) blocking removed. These are the ports that versions of Windows prior to Windows 2000 used to connect the Microsoft NetBUI protocol to the internet. There are many worms and viruses that use these ports to propagate. These ports, when open, allow anyone access to your computer, and should not be exposed to the internet; therefore, we block these ports to help shield your computer. This is the port that windows uses to share folders. The contents of the folders in your network neighborhood are transmitted over this port. This port is blocked to keep people from accessing your shared folders over the internet. Why do we block ports? We block these ports in order to increase customer side security and to keep worms and viruses from propagating from AP&T IP space. AP&T is committed to complying with U.S. copyright and related laws, and requires all customers and users of AP&T’s Internet service to comply with these laws. AP&T account holders should not use AP&T’s Internet service to infringe copyrights, furthermore it is our policy to suspend or terminate, in appropriate circumstances, the AP&T Internet service of any account holder who is a repeat infringer. When AP&T receives a notification of claimed infringement(s) from a copyright owner or its enforcement agent that complies with the requirements described in our Copyright Policy and Complaint Procedure, we will respond by contacting our customer via email with a DMCA Violation Notice. AP&T internet access subscribers can request a Peer-to-Peer (P2P) Blocking feature be applied to their account. The P2P Blocking feature will be free of charge until December 31, 2018 at which time AP&T will impose a monthly fee of $2.95 for the service. The P2P Blocking feature prevents hosts utilizing an AP&T internet access subscriber account from starting new connections to known P2P servers, however does not stop downloads or uploads already in progress. AP&T internet access subscribers must contact AP&T Technical Support at 1.866.793.4179 and ask for the P2P Blocking feature to be added to their account; The feature can be removed at any time thereafter. They say “an ounce of prevention is worth a pound of cure.” Except, of course, if you’ve made a very poor choice of when to schedule the prevention. Tuesday, Wednesday and Thursday from 2:00 AM to 5:00 AM. There are instances where the established maintenance window times are not utilized, in fact service should only be interrupted a few times a year. Thank you for your patience and understanding if this activity negatively impacts you.